After having spent the night in Port Hardy, we decided to ride stage 11 in reverse to Cape Scott Provincial Park, then loop back along stage 10 and up to Port Hardy before quickly riding stage 12 to our campsite for the night. As with all motorcycle trips, things don't always go as planned. Stage 11 (in reverse) began in Port Hardy on a foggy morning down by the docks near our hostel. After a quick breakfast and the daily route review, we set out on the road to Cape Scott Provincial Park. We were immediately greeted with thick, soupy gravel before we even made it 5 km into the stage. There must have been at least 3 inches of gravel on the road causing the front tires to drift and slip. While this was not an issue for me because of the additional stability I get from the sidecar, it was very difficult for the other riders to manage. Without knowing exactly how much gravel was ahead of us, and after taking a beating on Stage 9 the day before, the 1200 GS, V-Strom and Tiger 800 decided to turn back and see out some fast pavement by riding back to Port Alice for the afternoon. I couldn't resist the lure of San Josef Bay in Cape Scott, so I continued on alone. After about 15 km of that deep gravel, the road conditions turned into the usual dirt and gravel that most of the forest service roads are made of. Along the way, I took a break at the beautiful Nahwitti Lake with a glass-like surface reflecting the entire sky. I also made a quick stop at the Shoe Tree to observe the hundreds of shoes that have been nailed to the tree as a sort of memorial. Finally reaching Cape Scott Provincial Park was a huge achievement for me - it was my primary goal on the trip to see San Josef Bay. The hike out to the beach takes approximately 45 minutes each way. The hike itself is along a very easy, well groomed trail with lots of tree cover, bridge crossings and wooden foot paths. San Josef Bay itself was everything I could have hoped for and more. A massive expanse of wide open, sandy beach bordered by large hills on one side and beach trails leading off on the other side. The shallow rise of the beach causes the water to stretch out far into the distance at low tide making it a gentle hike just to even reach the water. San Josef Bay is considered by many to be the most beautiful beach on Vancouver Island, and I can easily see why. I love it and can't wait to visit again. personal experience along Stage 10, specifically the CH200 road and Port Hardy Road, I'd love to hear about it. Please contact me and let me know how it is. Stage 12 coming out of Port Hardy and riding to Telegraph cove is a nice change of pace with 120 km/hr speeds (of which my Ural has never, ever reached). The turnoff from the highway onto Beaver Cove Road is especially nice in the morning when the fog has settled leaving only a few hundred meters of visibility and an eerie feeling of riding through the silence. Telegraph Cove is a sight to behold with nearly the entire community sitting on a stilted dock over the water. It's a fantastic community with vacation rental cabins, kayak rentals, and a few really good food options for breakfast, lunch or dinner. We camped for the night at Alder Bay nearby and exchanged stories of our different routes. As soon as the sun set, we called it a night pretty quickly and looked forward to the next days ride taking us further south along the Vancouver Island Grand Loop. Stage 9 is easily the most enjoyable, challenging, remote, and beautiful stage of the entire Vancouver Island Grand Loop. For us, it started out cold and damp in the parking lot of the Woss motel. And by the end of the day, the sun had baked us all afternoon, we found an impassible dead end, the bikes took a beating, and we called it quits in Port Hardy. And this was from riding only one stage. We also reunited with one of the riders who we thought was out for good. Stage 9 can be broken up into 3 sections - Woss to Atluck Lake, Atluck Lake to Devil's Bath Lookout, and Devil's Bath Lookout to Port Alice. The stage starts with an impressive bridge crossing the river that drains out of Woss Lake. Afterwards, we began to climb in elevation which gave way to fantastic vistas of small mountains peaking above the clouds, long stretched-out valleys, and lush green forest roads that were heavily trafficked by logging trucks. A stop at Atluck Lake is an absolute must-do. The lake is sheltered by hills and mountains on all sides allowing for very little wind to disrupt the glass-smooth water. Backcountry camping is available shorefront on the lake which I will definitely be taking advantage of next time I'm riding through. Also, the road around Atluck Lake will always be remembered as my favourite - it's a twisty dirt road that hugs the wall of a mountain to the right and has an unobstructed view of the beautiful lake to the left. The road out of Atluck Lake and onward to Devil's Bath Lookout quickly descends into a very slow navigation of paths and trails with large fist sized rocks strewn all over. We also observed a lot of bear poop on the trails every 100 meters or so, but luckily/unfortunately we did not end up seeing any wildlife on this stage. It's rare that I engage 2WD on my Ural, however there were two long inclines littered with large, unstable rocks that required me to use 2WD in order to make it to the top. The rider on the 1200GS also experienced issues when his rear fender came lose from all of the shaking and became tangled with the rear tire. The damage to the fender was too severe and it ended up being thrown out when we arrived in Port Alice. Devil's Bath Lookout offers a nice rest from the previous highly technical trail riding. Less than 30 feet from the parking area, you can view a large bowl-like formation in the ground that is filled with water and fallen trees. The roads from this point on to Port Alice are all very easy dirt and gravel, and after riding so slowly on the rocky trails, we found ourselves speeding along at 80-90 km/hr on these relatively well-groomed roads with ease. Until I ran out of gas, that is. A previous version of the Vancouver Island Grand Loop had indicated that it was possible to ride around the south end of Victoria Lake. However, after riding for 30 minutes on rough dirt and gravel, sneaking our motorcycles under a locked gate, and bushwhacking with the spiders, and coming within 2km of joining a road in good condition, we hung our heads low and admitted defeat. I really don't think it's even possible to hike around the south side of the lake. We had a heck of a lot of fun, though! Once we arrived in Port Alice, we grabbed a very late lunch at the local grocery store and then made a bee-line to Port Hardy for the evening. We also received good news from the Triumph Tiger rider who had the fork seal issues. Savage Cycles in Victoria was willing to bump up the work and install new fork seals the morning after Dave rode home. Once the work was complete, Dave jumped on his motorcycle and rode from Victoria straight to Port Hardy having only really missed one day of the trip. After swapping stories and celebrating over beers at the pub, we started planning out the next leg of our trip to Cape Scott and back. Prior to starting out, one of the riders in the group was experiencing electrical issues with his V-Strom and decided to take it to a local Suzuki dealing in Courtenay to a checkup. The remaining three of us decided to push forward and we would meet up later in the day near Gold River. Stage 7 quickly moved off the main highway onto the private Iron River Rd. We made good time on this road which was in pretty good repair, except for one memorable pothole just after crossing one of the small bridges that caused everyone to slam on the brakes and still hit it pretty hard. Happy that no one bend a rim, we continued on past some cute little lakes and jumped onto Highway 28 which would take us the rest of the way into Gold River. The highway had some minor construction, but the constant and beautiful views to the right were well worth any delays we experienced. for a few minutes, this stage was fairly easy with a lot of great scenery to take in. Muchalat Lake was especially beautiful, and I expect that Vernon Lake would have been nice too, except that we completely missed the turnoff to Vernon Lake Rd and ended up taking Nimkish all the way to the highway. We had a late start to the day, and it was getting even later now, so we decided against backcountry camping in Zeballos and grabbed a couple rooms at the motel in Woss for the evening. Happy with our progress for the day, we had no idea what difficulties laid ahead of us on Stage 9. After a quick lunch in Bamfield, we visited trailhead for the truly amazing West Coast Trail, which is a 5-7 day backcountry hike starting in Port Renfrew and involving river crossings, ladder climbs and cable car crossings. Stage 5 will be remembered as the most punishing to the motorcycles. The road itself isn't really all that challenging. Most of the sections of road are straight, easy to stay on the main road, lots of signs, and wide roads to travel on. However, the state of the road is a complete nightmare. There are potholes almost everywhere. Where there are no potholes, the roads has a permanent ripple to it. And every hill climb is pockmarked with large rocks jutting out. Lowering the tire pressure was an absolute necessity, so we dropped 10 lbs in each tire and it made a world of difference. windshield bracket on the Ural had shaken loose and needed to be reinstalled and tightened back up. And finally, the fork seals on the Tiger had started to weep a fair amount - nothing to worry about just yet, but this would come back to cause issues for us in a few days. Stage 6 lead us out of Port Alberni where a weather system caught up to us and it began to downpour. It was our first and only period of rain during the trip, but it was long enough and intense enough that it soaked us pretty well before we decided to pull over and throw on our rain gear. No one complained because we were on well paved roads, and it was a heck of a lot better than being caught in the rain back on Stage 5! Once we passed the Coombs turnoff and connected onto the main highway, we made a bee-line toward Mount Washington where our alpine resort waited with underground parking, a hot tub, and a large plush bed. Five of us began the journey at the top of Beacon Hill, but not all of us would finish. Before the week is through, we would see one motorcycle turn home unable to continue, fork seals blown, a dropped bike, a chain guard ripped off, a fender cannibalised by the rear wheel, a light bulb shaken to destruction, oil leaked and gas spilled. This is the Vancouver Island Grand Loop. I lead the team on my Ural Patrol with very little experience riding off road, but a willingness to learn and a good sense of direction. Dave followed on his Triumph Tiger 800. Next was Dave's brother Peter, the most experienced off road rider of the group on his BMW 1200GS. Marvin heard about the trip through his son and travelled from Calgary to join us on his Suzuki V-Strom with a moderate amount of off road experience. And finally, Dave's friend, also Dave, joined us only for the first day on his Suzuki V-Strom before he had to go back to work. Stage 1 starts at the very top of Beacon Hill in Victoria, with the historic Mile Zero of the Trans-Canada Highway and the statue of Canadian hero Terry Fox in sights at the bottom of the hill. After a late start with brunch downtown, we slowly make our way out of the city along nicely paved roads, down past the Esquimalt Lagoon, into the lazy roads of Metchosin and further into the beautiful winding roads of East Sooke. favourite for riders who enjoy a spirited early morning ride before the weekend RV traffic picks up. Our first taste of failure is served when we try to locate the largest Douglas Fir in the world just outside of Port Renfrew - the Red Creek Fir. Between Google Maps, some printed directions and spray painted roadside signs, we just couldn't find the right path to the tree. Faced with dirt resembling talcum powder and a gravel path that was growing in on itself, we decided to finally turn back when one of the riders took a fall trying to turn around on a steep incline. After a relaxing dip in Lake Cowichan, we went to bed tired and beaten, but still optimistic about the week of adventure ahead of us. The Vancouver Island Gran Loop summer trip is now about 95% complete and planned out. Along with myself, three other riders will be riding the VIGL on August 20th for 6 days. I'll be riding my Ural Patrol, and they'll be on dualsports: a Suzuki V-Strom 650, a Triumph Tiger 800, and a BMW 800GSA. The pace will vary between slow, medium and fast. We’ll discuss the route each morning and plan out meeting points along the way for everyone to ride at their own pace. I’ve given the Ural a few pretty thorough shakedown rides so far this summer to get a feel for how it would perform on the trip. 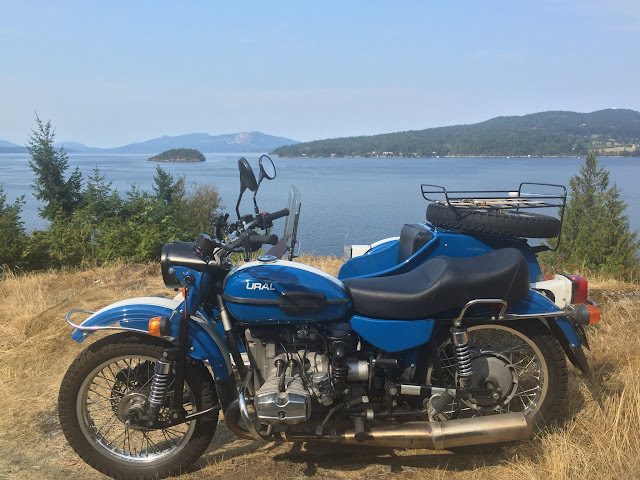 The bike has been on multiple camping trips, I rode support for the Victoria Ironman Race, toured Pender Island, and even went to the top of Mount Prevost a couple times as well. Brand new tires were installed by the Adrenaline Motorcycle Co-op (mounting and balancing free with an annual membership) last weekend and now the bike and I are ready and waiting for August to arrive. If you’re interested in joining us, check out the Facebook event page and contact me for more information. And finally, I want to say thank you to a host of people who have provided valuable feedback and support toward creating and maintaining the Vancouver Island Grand Loop. Without passionate adventurists like you, none of this would have been possible. David M – A fantastic donation to assist with maintaining the site and the route. Bart V – Local knowledge and status of logging roads and gated roads around the mid-Island. Sandy M – Recommendations for Stage 6 modifications due to gated logging roads. Todd D – Current status of multiple stages from Gold River to San Josef. And all the great feedback I’ve received from people on the Soviet Steeds forum, the ADV forum, and the Lower Island Riding Club. Thank you very much everyone. It is all highly appreciated! Planning the big Vancouver Island Grand Loop 2016 ride continues as we move into the heat of summer and motorcycling season comes into full swing. If you haven't already, I'd encourage you to join one of the many events occurring this summer around Victoria and Vancouver Island. The Lower Island Riding Club has a few planned, including the annual Summer Camp that I'm hosting. The Motorcycle Rides & Events Around Vancouver Island group also has, as you'd expect, many rides and events posted. Have a safe ride, everyone. It's official: I'm riding the Vancouver Island Grand Loop this summer. I'll be taking my 2013 Ural Patrol with lots of spare parts, extra gas, and way too much camping gear. The pace will be pretty comfortable with 4-5 hours of riding each day, and plenty of time to relax at the end of each day. Rather than do this alone, consider this your open invitation to join me for the entire ride, or for part of the ride. If you're interested, get in touch with me and we'll figure things out. Cheers! Accommodations: The end; go home.